KANSAS CITY, Mo. 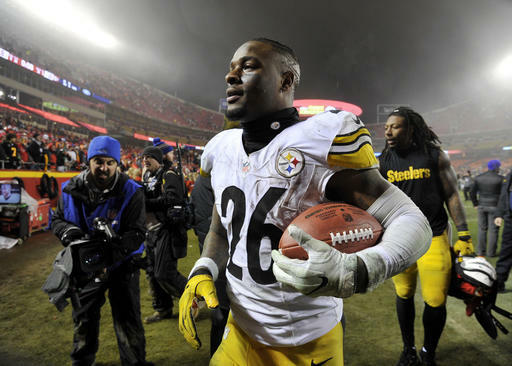 (AP) — Le’Veon Bell deftly danced his way through the teeth of the Kansas City Chiefs on Sunday night. Next, he’ll carry Pittsburgh Steelers off to New England. With his amusingly patient, maddeningly effective running style, Bell followed up a stellar wild-card effort against Miami with 170 yards rushing at Arrowhead Stadium. He kept churning for first downs when the game was hanging in the balance, helping the Steelers persevere for an 18-16 victory. Next up is Tom Brady and the Patriots with a spot in the Super Bowl on the line. Then again, Bell is becoming one of the best running backs to do this. He had four consecutive 100-yard-plus efforts late in the season, including a 236-yard outing against Buffalo. He followed with 167 yards rushing against the Dolphins before causing all kinds of heartburn for the Chiefs, who always seemed to be where Bell was just a moment ago. Just about the only thing missing from his line Sunday night was a touchdown. The Chiefs kept stiffening in the red zone, and held the Steelers to a playoff-record six field goals by Chris Boswell. But that turned out to be enough on a night when Kansas City struggled to get into any kind of offensive rhythm, and the Steelers were able to ride Bell to victory. The Steelers and Patriots will be meeting in the playoffs for the first time since January 2004, when New England rolled through Ben Roethlisberger and Co. in the AFC title game. They went on to beat the Philadelphia Eagles in the Super Bowl two weeks later. NO BEN LAST TIME: When the Patriots beats the Steelers 27-16 on Oct. 23, Roethlisberger was sidelined with a left knee injury. With Big Ben in sweats on the sideline in Pittsburgh, backup Landry Jones was 27 of 49 for 281 yards with a touchdown and an interception in his third career start. Since Roethlisberger joined the Steelers, they are 3-7 against New England overall, losing their only playoff matchup. They are also 1-4 at Foxborough, the win coming when Tom Brady was hurt in 2008. Roethlisberger is 3-1 in AFC championship games, though, and 2-1 in Super Bowls. KELCE SOUNDS OFF: The Chiefs appeared to have made a 2-point conversion to tie the game in the closing minutes, but left tackle Eric Fisher was called for holding. The Chiefs had to attempt the conversion again and Alex Smith’s pass fell harmlessly to the turf. Tight end Travis Kelce spent his entire postgame media session — all 90 seconds that the Chiefs’ media staff allowed — ripping the penalty, referee Carl Cheffers and the rest of his crew. THE OTHER KILLER B: Antonio Brown was relatively quiet most of the night, except for a 52-yard reception early in the game, when the Steelers’ star wide receiver somehow got matched up 1-on-1 with linebacker Justin Houston. But he still finished with six catches for 108 yards. None of them was bigger than the final one, a 7-yard catch on third-and-3 at the Pittsburgh 2 with 1:53 left. The first down allowed the Steelers to run out the clock. BERRY FAREWELL: Eric Berry may have played his final game with the Chiefs, though the perennial Pro Bowl safety is hopeful he can sign a long-term contract to remain in Kansas City. Berry played this season on the franchise tag, but his value has skyrocketed with arguably the best season of his career. And that might make it difficult for the Chiefs to afford him, especially after they were unable to work out a long-term contract in the offseason. SAME OLD STORY: The Chiefs fought to the end of the season to win the AFC West, earn the No. 2 seed in the playoffs and receive a first-round bye. But maybe next time they’d be better off tanking: They’ve earned a bye and home playoff game four times, losing all of them.